Priced based on serving sizes of 24-30 people. LIGHT HORS D’OEUVRES $50 Veggies & Dip Tray Broccoli, Carrots, Grape Tomatoes, Snap Peas, and Ranch $40 Cheese & Cracker Tray Cheese slice selection, both party and club crackers $40 Cookie Assortment Tray Chocolate Chip, Peanut Butter, & Oatmeal Raisin $40 S’mores Campfire Marshmallows, Chocolate Bars, and Gram Crackers. S’more Sticks, Lighter, and Firewood will be left at the fire ring of your choice. HEAVY HORS D’OEUVRES $100 Meat/Cheese/Sliders Tray Turkey/Roast Beef/ Ham/ Cheese slices, Ciabatta rolls, with condiment packets HOT BUFFET MEAL $450 BBQ Brisket Meal BBQ Brisket, Buns, Sauce, Potato Salad, Baked Beans, Coleslaw $450 Pork Tenderloin Meal Pork Tenderloin, Cranberry Apple Stuffing, Glazed Sweet Potatoes, Green Beans, Rolls DRINK SERVICE $50 Basic Drinks Coffee, Tea, Water $50 White Almond Punch As a reminder, the only outside food allowed to be brought in for your event is a special cake. Also, any special requests can be arranged with the Guest Group Director. This lovely, roofed open-air chapel is located on our main campus. A beautiful blank canvas of a building can be decorated in many ways and chairs set up. Simple and rustic. All eyes will be on the happy couple as they wed surrounded by nature. Keep in mind we have lodging facilities available for overnight guests. Located on Sallisaw Creek, just down from our main campus. This open-air chapel has wooden benches which can seat up to 40 people and additional chairs can be added. The benches face the pulpit and creek with a cross on the hill. A food buffet can be set up in a nearby pavilion. You may also wish to rent our trailer to give your guests a memorable hayride down to your wedding. Right next to the Dining Hall, this large indoor conference room with high ceiling and big windows could easily be used for your ceremony or reception. Tables and/or chairs can be arranged and decorations set up for your big day. For a reception, the food buffet can be set up with your cake on display. Don't forget to checkout our catering packages! This large room would be perfect for any reception. The Dining Hall also has and AV system with sound, projector, and screen. Tables and chairs can be arranged and decorated. Hot food can be served directly from our kitchen and buffet set up. 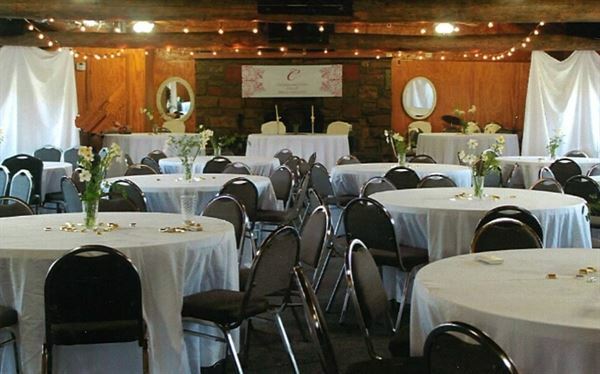 This log cabin located on our main campus can be used for a ceremony, reception, or both. Oxley has an AV system with sound, projector, and screen. There is a lifted chancel area or stage at the front of the room and restrooms in the back. Tables and chairs can be set up and creatively decorated for your special day. A food buffet can be set up, remember we offer catering packages! Special Features: Dwight Mission has everything. We have both indoor and outdoor ceremony and reception sites, full catering, overnight accommodations and staff to provide additional services. With its breathtaking view, Whitney Mountain Lodge is a unique & beautiful facility for retreats, a great wedding & reception venue, a spectacular banquet and special events destination. We are perched 700 feet above the sparkling waters of Beaver Lake in Northwest Arkansas. Schedule a tour and discuss your event with our Event Coordinator.